Hanoi (VNA) - The massive stimulus package of 30 trillion VND (1.32 billion USD), introduced in 2013 to encourage social housing development in Vietnam and revitalise the listless real estate sector, has been entirely disbursed. However, with the expiry of the attractive interest rates, many businesses are contemplating pulling out of the social housing market while the demands show no signs of flagging. In a recent conference on measures to kick-start the real estate market towards the end of 2017, Vu Van Phan, deputy head of the Ministry of Construction’s Housing and Real Estate Market Management Department, admitted that there have been cases where businesses asked to withdraw from social housing projects. In April, the National Assembly allocated 2 trillion VND (87.9 million USD) to the construction of houses for contributors to the revolutionary cause as well as social housing projects, with more than half of the figure (1.160 trillion VND) reserved for the latter purpose meant to be the continuation of the now expired stimulus package, but this amount is “still too little and not enough,” Phan said. He also added that the construction ministry is asking the government for more financial support for social housing businesses as well as homebuyers, but that remains a distant vision. Prime Minister Nguyen Xuan Phuc signed a decision dictating the interest rate for social housing loans in 2017 at 4.8 percent a year – even lower than the 5 percent interest rate in the now expired stimulus package. But, it is reported that no allocation from the state budget has been made available to commercial banks, so in reality, nobody has really benefitted from this policy. 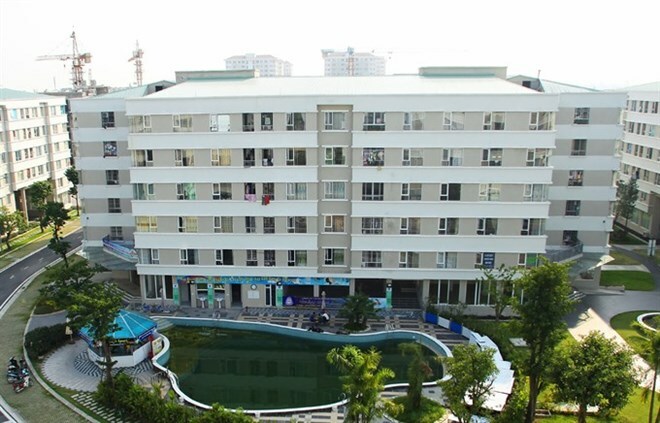 Truong Anh Tuan, Chairman of the board of Hoang Quan Group, a Southern-based real estate corporation, said that their original plan was to implement 20 social housing projects throughout the country. However, since there are no longer any stimulus packages for businesses or homebuyers, the company has to postpone the schedule of many projects. The lack of capital also caused the company to fail to hand over finished apartments to customers in time as per the contracts. To continue with construction, in addition to what capital the company has at its disposal, it has to seek loans from commercial banks at commercial rates and mobilise capital from the stock market. Nevertheless, the majority of Hoang Quan Group’s social housing projects still fall behind schedule. According to existing regulations, housing projects are required to set out 20 percent of the project land for social housing. The new law is considered “fairly flexible” in this regard as it allows businesses to contribute through land, apartments, or monetary means, if the project’s total area is less than 10ha. The last form of contribution is the preferred option for most businesses. The association recommended the city focus its resources as well as call on the involvement of real estate businesses to implement affordable or social housing projects, to serve the “growing but largely unmet demands” from middle-and-low income demographics, civil servants, manual workers and immigrants. Furthermore, according to Chau, the law states that the fund for the development of social housing projects can come from “official development assistance or preferential loans from donors”, which he said “is a highly potent source of funding”, however, up to now, there hasn’t been any guidance for this mechanism. According to Tran Trong Tuan, head of HCM City’s Department of Transport, the loan package is meant to ‘stimulate’ this oft-overlooked market as well as “plant the seeds” for the further development of social housing projects, and “the package is not meant to last forever”. In the long term, existing laws must be observed in full, especially making use of housing credit funds to support social housing programmes.